Single Angle Cutters, offered by us, are designed for chamfering or beveling parts. Our Single Angle Cutters are manufactured in Single Right and Left Angle in any degree. Double Equal Angle Cutters are generally used for milling threads, V-grooves, serrations, and other angular surfaces. 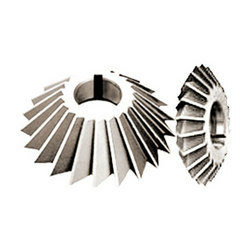 Double Angle is generally supplied in 45o, 60o, & 90o Included Angle.